If Mitt Romney is elected president, the White House will likely see some new traditions. What would a Mormon White House look like? Given the importance of the Book of Mormon, this question seemed worth asking: Any chance Romney would place his hand on a Book of Mormon at his swearing-in ceremony? Most likely, Romney would go back to the Bible he used in 2003 when he was sworn in as governor of Massachusetts – the same one his father, George Romney, reportedly used when he was sworn in as Michigan’s governor in the 1960s. Having never been invited over for a meal, we can’t pretend to know anything about the Romney aesthetic when it comes to home decoration. But we wondered and asked about specific items that tend to hang in Mormon households. Randall Balmer, an award-winning historian, author and chair of the Department of Religion at Dartmouth College, speculated that the Romneys – like plenty of Mormons – might display artwork featuring a depiction of Jesus and a photograph of LDS Church President Thomas S. Monson, considered a “prophet, seer and revelator” by members of the church. Another possibility, said Riess, would be a photo of the Salt Lake Temple where Mitt and Ann Romney were married and “sealed” for eternity in a sacred ceremony in 1969. The proclamation features words set forth by LDS Church leadership in 1995, highlighting family and gender responsibilities. Among the points made: Marriage is between a man and woman; the primary responsibility of fathers is to oversee and provide for families; and mothers must first and foremost care for the children. All of these items could show up in the White House, said Grant Bennett, an old Romney friend who spoke at the Republican National Convention and has known the Romney family since they met through church in 1978. But he said, “the most quintessential Mormon item would be pictures of their family,” including those of ancestors, because “families are forever” and bound for eternity in the Mormon view. 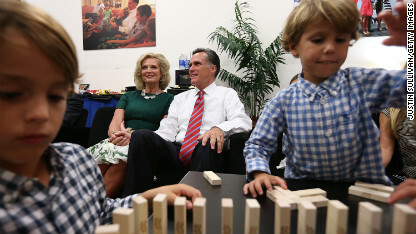 Ann and Mitt Romney are surrounded by family before the October 22 presidential debate at Lynn University. Bennett also suggested that a verse or two of Scripture that is particularly meaningful to the Romneys might be framed and on display. If any of these things would hang in the White House, they would likely appear in the private quarters where first families are free to do what they please. That doesn’t mean Romney wouldn’t be allowed to honor his faith in some way in the Oval Office, but decorative decisions in public rooms – the spaces visited on tours – are subject to committee discussions and advisers on historic preservation, explained Melissa Naulin, assistant curator in the Curator's Office of the White House Museum. Can I get a cup of coffee? How about something stronger? In accordance with a revelation received in 1833 by LDS Church founder Joseph Smith, something known as the “Word of Wisdom,” faithful Latter-day Saints abstain from coffee, tea and alcohol. Does this mean a return to the days of “Lemonade Lucy,” the posthumous nickname given to the wife of Rutherford B. Hayes, the 19th U.S. president, who banned alcohol from the White House? No, said Cabinet members from Romney’s gubernatorial era and a current top aide. They said this health-related observance is not one the Romneys would impose on or expect of others. “As governor, when Mitt Romney entertained at official functions in the evening, alcohol was served along with soft beverages,” said a senior aide who asked not to be identified in stories about religion. “There was always a healthy cup of coffee for anyone who wanted it,” said Renee Fry, a former Cabinet member. The LDS Church advises its members to store enough food to feed a family for a year. Food storage is viewed as a practical measure, one that can come in handy during, say, a crippling superstorm, massive power outages or unforeseen financial hardships. The practice is rooted in Mormon history. The church’s early pioneers, on their trek westward to what is now Utah, experienced great suffering and starvation. They also endured their share of persecution and couldn’t rely on the help of others. So having resources squirreled away became a collective comfort. Any chance that the Romneys would institute White House food storage? 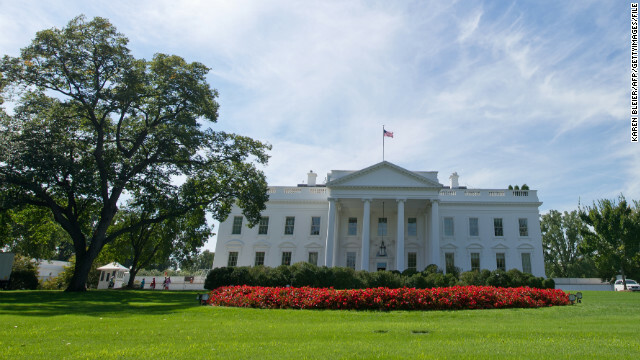 Not because they would need it for themselves or likely anyone else at the White House, but Riess said in these uncertain times, it could be a good lesson in preparedness to showcase to the nation. “I wouldn’t be surprised to see that,” she said. 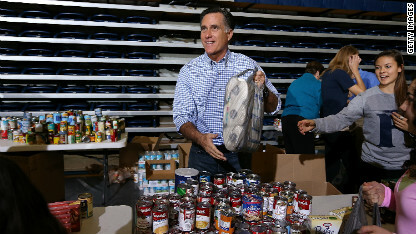 Mitt Romney gathers donations in the wake of Superstorm Sandy. Even if a family storing it doesn’t need the food, by having it available that family is poised to help others. Serving those less fortunate or in crisis is big in the LDS Church, and it is a part of another practice that may find its way into the White House if the Romneys move in. The first Sunday of every month is Fast Sunday, when committed Mormons who are able forgo food and drink for about 24 hours. Coupled with prayer, it has spiritual meaning. It also serves to instill compassion for those who are in need, and to that end Mormons are encouraged to minimally donate what they would have spent on food to the church’s welfare fund. Fast Sunday, or calls to fast at other times, can also bind Mormons together when they pray and fast for a common cause. A Utah woman created buzz earlier this fall when an e-mail she sent out to friends and family, suggesting they fast to help Romney before the debates, began making the rounds in Mormon circles across the country. A new website, romneyfast.org, also the brainchild of private citizens – and not a church-sanctioned effort – asks people to fast and pray for Romney and his wife Ann this Sunday before America goes to the polls. When he was governor of Massachusetts, and in general, Mitt and Ann Romney observed Fast Sunday and “always contributed very generously to the fast offering fund,” said Bennett, who held church leadership roles with Romney in the Boston area. What’s more, Bennett said that when Romney served as their congregation's bishop – the equivalent of an unpaid pastor – it wasn’t uncommon for the two friends to fast more than once a month. At the time, Bennett was one of Romney's two counselors, or advisers. Whether Romney would maintain this observance from the nation’s highest office, we can’t know. But it looks like the White House kitchen staff may be in for a little downtime each month, if they’re lucky. Sunday is a holy day for active LDS Church members. It’s a time when Mormons attend their local congregation - it's known as a ward, which in Catholic-speak would be comparable to a parish - and worship with their families and community. The ward closest to 1600 Pennsylvania Ave., and likely the one the Romneys would be assigned to, is the Washington D.C. 3rd Ward, which gathers in what Mormons call a “meetinghouse” or chapel on 16th Street NW. The Washington Post described this ward as consisting of mostly Democrats, half who are nonwhite (including plenty of Spanish speakers), and having openly gay members in its leadership. Riess said while ward assignments are almost always determined geographically, sometimes there are exceptions. And the truth is there just isn’t any precedent for how this would be handled for a U.S. president. How much of his Sundays a President Romney could set aside for his faith is obviously uncertain. We already know he’s been hard at work on the campaign trail, Sundays included – though the senior aide we spoke to said he makes efforts to get to church when he can. Romney faithfully showed up at church on Sundays while he was governor, unless an official function got in the way, Bennett said. And when Romney ran for U.S. Senate in 1994 against Ted Kennedy, Bennett – then the ward’s bishop – assigned Romney to teach the weekly adult Sunday school class. “He was in church virtually every Sunday teaching this class throughout the campaign, only occasionally arranging for a substitute teacher,” his friend said. Beyond church, Riess speculated about other observances Romney would uphold. Mormons reserve Monday evenings for “family home evening,” a time when families pray, study and sing together. Someone serving in church leadership, who didn’t want to be named because of the sensitivity of the subject matter, said he doubted the Romneys would observe family home evening since their kids are grown and gone. But Riess suspected that Romney and his wife, especially given the size of their brood – five sons; 18 grandchildren – and the likelihood that family would be passing through, would honor the Monday tradition in some way, even if it was just the two of them. There’s also a practice in LDS Church wards in which men who hold the priesthood – which means the authority, for example, to perform baptisms and offer sacramental blessings – are partnered up to visit other congregation members, ideally once a month, as home teachers. The LDS Church does not have paid clergy, and this is one way that volunteer ward pastors, or the bishops, can make sure members get personal attention and lessons as needed. So could home teachers come knocking on the White House doors? It’s possible, said Riess, though obviously there’d be background checks and no unannounced knockings. But a U.S. president couldn’t possibly be expected to regularly home teach others, right? Probably not. But Romney did step up as governor, Bennett said. And then there’s the big question: What about the temple? Many non-Mormons falsely assume the large and often magnificent white LDS temples they see in their cities are where Latter-day Saints go for church. But Mormons gather for Sunday services in meetinghouses or chapels, which are usually plain, unimpressive structures. 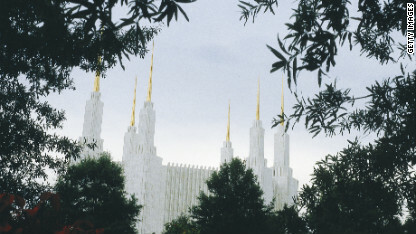 The Washington D.C. Temple, not too far from the White House, is considered by Mormons to be a house of the Lord. The 140 temples currently in operation across the globe are actually closed on Sundays. Mormons view their temples as houses of the Lord, as Riess explained in her book, and they are not places for run-of-the-mill worship. Temples, instead, are reserved for the most sacred rituals – the details of which are not to be discussed outside temple walls. The temples are so sacred that the doors are not even open for all Mormons; only those deemed sufficiently worthy by local church leadership are granted a “temple recommend” or an entry card. While sacred ceremonies or “ordinances” for the living – such as weddings, during which couples are “sealed” for eternity – happen inside, there are also rituals performed by living substitutes or proxies for those who have died. These rituals include baptisms, which have been at times a subject of controversy for the LDS Church. Romney, who long served in church leadership, surely has a temple recommend. But does that mean he’d actually go to the Washington D.C. Temple, which sits about 10 miles north of the White House in Kensington, Maryland? And a President Romney couldn’t go there, let alone anywhere else, without Secret Service. So if he wanted to go, would he be able to? Even Secret Service agents would be turned away from the temple without the right access card. Not a problem, speculated Balmer of Dartmouth. He said finding qualified agents, if Romney hasn’t found them already, would be easy. It’s well-known that the CIA, FBI and, by extension, he said he assumes, the Secret Service recruit at LDS Church-run Brigham Young University. All these agencies, Balmer said, are “looking for people who are good, loyal, patriotic Americans,” and many Latter-day Saints, who believe in the divinity of the U.S. Constitution, fit that bill. So if it would be important for Romney and the first lady to go to the temple, it should be possible. And Riess said, given Romney's level of faith and church involvement over the years, she can’t imagine that he wouldn’t want to go. Minimally, she pointed out, there’s bound to be a family member’s wedding or “temple sealing” he’d want to attend. « Previous entryDo you believe in a red state Jesus or a blue state Jesus? ugg boots cheap sale new nfl jerseys louis vuitton outlet chanel hendbags sale Driving a residents benefit from excellent gas mileage and plenty of bang for their buck. Check out the selection of new and pre-owned vehicles at . Every citizen who is sincere with his country he will support to complete the duration of president. Free speech helps educate the masses................POLITICIANS too !........it did not happen . I've already seen the Mormon Tabernacle in Salt Lake City. Don't need one in D.C. Thank you. There has been one there for about 50 years, so you are too late. Indeed, as a free nation, with a TRUE Separation of Church and State we can go forward now, knowing that NOBODY will ever give a mormon a second chance for the White House. And finally, we don't have to listen to really stupid things like "what would a Mormon White House look like." MY GOD, MY GOD why hast thou forsaken me? Message not delivered. Unknown recipient. Please check recipient's address.